I’ve had lots of requests for tutorials, so I’m incorporating a tutorial on my website of a workshop I’ll be conducting in Plano, Texas on March 22nd. 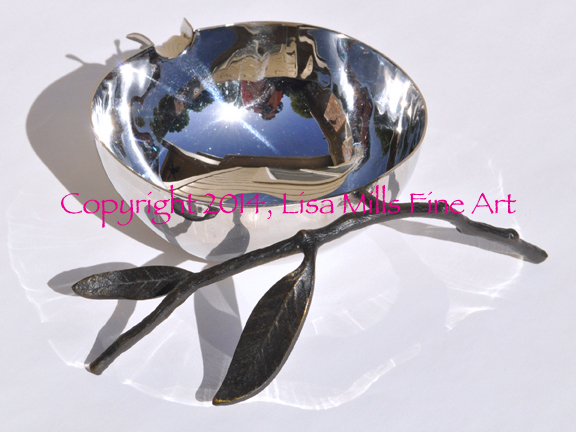 This tutorial is available free to the workshop participants, but you can purchase it for only $15.95 after March 31, 2014 on my website, http://www.lisamillsfineart.com. This is a step-by-step approach similar to what I authored for Ann Kullberg, but the project is more simple and involves less steps. You will be using colored pencil on Art Spectrum Colourfix Suede paper to learn to illustrate this little silver nut bowl. The photo above is the reference photo you’ll be using in the tutorial. There is a photo and detailed instruction for each step of the project. A supply list will also be provided. All supplies are readily available at major online art supply retailers in the United States. My favorite retailer is DickBlick.com. Once the tutorial is live and available, I’ll update you here…so stay tuned!